Differential equations can be solved with different methods in Python. Below are examples that show how to solve differential equations with (1) GEKKO Python, (2) Euler's method, (3) the ODEINT function from Scipy.Integrate. Additional information is provided on using APM Python for parameter estimation with dynamic models and scale-up to large-scale problems. GEKKO Python solves the differential equations with tank overflow conditions. When the first tank overflows, the liquid is lost and does not enter tank 2. The model is composed of variables and equations. The differential variables (h1 and h2) are solved with a mass balance on both tanks. Euler's method is used to solve a set of two differential equations in Excel and Python. See Introduction to Using ODEINT for more information on solving differential equations with SciPy. This tutorial gives step-by-step instructions on how to simulate dynamic systems. Dynamic systems may have differential and algebraic equations (DAEs) or just differential equations (ODEs) that cause a time evolution of the response. 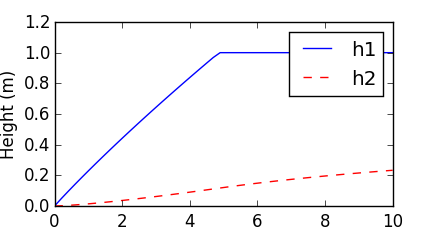 Below is an example of solving a first-order decay with the APM solver in Python. The objective is to fit the differential equation solution to data by adjusting unknown parameters until the model and measured values match. This same example problem is also demonstrated with Spreadsheet Programming and in the Matlab programming language. Another example problem demonstrates how to calculate the concentration of CO gas buildup in a room.